The World Championship elite men’s road race this year could be one of the most intriguing races for a long time with opportunities for a whole range of different types of rider to get their hands on the coveted rainbow jersey. 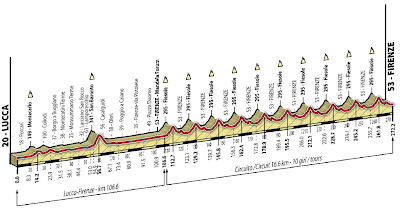 At 272.2km, it will be a long day for the riders and it will be a tough ride, particularly once the circuits around Florence start. The laps are 16.6km long and will test the riders to their limits. The Fiesole climb is 4.4km long with an average gradient of 5.2% with a steep section of over 10% at the end of the climb. They then embark on a reasonably technical descent down from Fiesole, then the short climb on Via Salviati. The climb is only 600m long, but with an average gradient of over 10% and a section of 200m at over 16%, it could be the perfect spot for the climbers to launch their attacks. The favourite for this race is Fabian Cancellara. He has been targeting this race since the spring and would appear to be in excellent condition. His third place in the ITT, just two seconds behind Bradley Wiggins was far better than I expected, and it is hard to see him not being in the mix. On a classics-type course such as this, he will be fancying his chances, and he will view the technical sections of the descents as an opportunity to force the others to push themselves. The only real question is whether he can stay will the punchier climbers on Fiesole and Via Salviati, but Matej Mohoric, the winner of the U23 race, said that the course is not quite as difficult as it looks. Peter Sagan has had an excellent year and will be hoping to cap it off with the World Championship title. It will be difficult to drop him on these short punchier climbs and if he is there at the finish, he will be the favourite in a sprint. However, there have been some questions concerning his tactics in the Classics and he is yet to win a long race such as this. Despite this, he is the second favourite and will certainly be one to watch. The defending champion, Philippe Gilbert, finally won a race in the rainbow jersey at almost the last possible opportunity in the Vuelta. A few years ago, you would have marked Gilbert down as the big favourite for a race like this, but his form has dropped off. 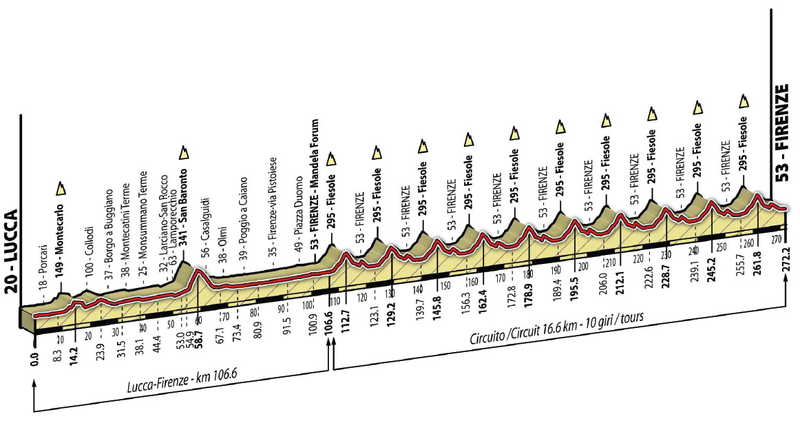 To win this, Gilbert will probably have to look to get away on the final lap up either the climb to Fiesole or Via Salviati. Whether he can get away, given the form that he is in, remains questionable. However, it is dangerous to write off someone like Gilbert in a race such as this. The next group of potential winners are the GC-type riders. The likes of Vincenzo Nibali for Italy, Alejandro Valverde, Joaquim Rodriguez and Alberto Contador for Spain, Chris Froome for Great Britain and Nairo Quintana for Colombia. Any of these riders will know that they have to lose the likes of Cancellara, Sagan and Gilbert if they are to stand any chance of winning this race. These riders will likely attack on the final lap ascents to Fiesole and Via Salviati. The final climb of Via Salviati is most likely to be where the race really kicks off – on steep climbs like this, few can stick with Joaquim Rodriguez, while Nibali and Froome have both shown their ability to ride away from the field in the Giro d’Italia and Tour de France respectively. If it comes down to a group of GC-type riders, Alejandro Valverde will fancy himself to have the best sprint finish. It is also worth keeping in mind those riders that perform well in the Classics. Especially if Mohoric is correct in that the course is not quite as tough as it appears, this brings this type of rider into contention. Edvald Boasson Hagen is certainly one to watch. He is capable of sticking with the peloton on some of the trickier climbs and he would certainly fancy his chances in a sprint in a reduced group. Ian Stannard performed well this year and looked in excellent shape during the Tour of Britain. If there are any problems with Chris Froome, particularly if he decides that he cannot get away on the short climbs, Stannard could well become Great Britain’s second choice. The likes of Maxim Iglinsky, Carlos Betancur, Zdenek Stybar, Jan Bakelandts, Thomas Voeckler, Warren Barguil, Nicolas Roche and Diego Ulissi cannot be discounted either. 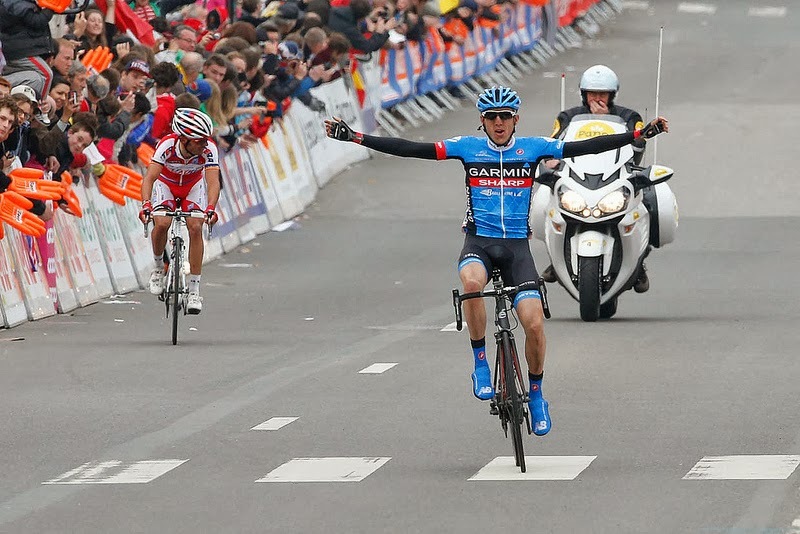 Two particularly interesting riders are Dan Martin and Rui Costa. Martin looked in good form at the Tour of Britain, particularly on the steep climb to Honister Pass, plus he has proven ability to win these long races. His performance at Liege-Bastogne-Liege is particularly relevant here, having won a long race and showing excellent tactics at the end. He has a good turn of pace if it comes to a sprint in a small group and he is not afraid to attack on the climbs. Similarly, Rui Costa has been in excellent form this year, winning two stages in the Tour de France and will be hoping that he can attack and hold onto a lead. The final twist to this race is that rain is expected on Sunday. This could make the descents particularly difficult, plus making attacking on steep slippery and possibly oily roads tough. On the later circuits, we might see the top descenders looking to take a few risks and put their challengers under some pressure. The likes of Fabian Cancellara, Vincenzo Nibali and Peter Sagan could put some of the other hopefuls under real pressure if they decide to rocket down the technical parts of the descents. In terms of riders that have performed well in bad weather this year, Nibali in the Giro certainly springs to mind, while those riders that performed well in Milan-San Remo (Sagan, Cancellara and Stannard) must be worth a look. Overall, it has the potential to be an enthralling race with different groups of riders looking to employ a range of tactics. Picking a winner is certainly not easy, but a few bets do stand out.